Outsource2india provides top of the line 3D modeling, drafting, and ideation services that bring to life your ideas and views for marketing, brand building, and visualization purposes. We boast of a highly skilled and creatively motivated team of modelers, drafters, and designers who deliver 3D modeling services for various industries. We focus on 2D to 3D modeling services that involve surface modeling to animated and detailed exploded views for better understanding heavy machineries. 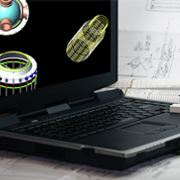 Aiding top leaders in Mechanical engineering industries, Outsource2india excels in 3D CAD models using SolidWorks. We provide designs for manufacturing, industrial designs, production comparisons, and product assemblies. Discover how Outsource2india helped a US-based scaffolding giant with MTO detailing from GFC drawings. O2I Provided 3D Modeling and Flyover Design Services to a Top US Engineering Firm O2I created 3D modeling of a Flyover using 3DS Max software using the SketchUp drawings of the project provided by the US client. The client was overjoyed with the quality of service and that we successfully delivered the project within a week. We have been offering top-quality mechanical services to global clients for over 20 years now. This rich industry-specific experience enables us to provide quick and accurate services that precisely cater to your needs. We also provide quality services of piping design and drafting, 3D modeling and rendering, CAD conversion, etc. Read the case study on how O2I Provided 3D Modeling Services to Top US Insulation Solutions Provider. For high-quality, affordable, and fully customized 3d modeling & mechanical drafting in India, just get in touch with us today.